Other mirror concepts have been proposed over the years, such as multiple mirrors (a configuration with many identical mirror cell linked together) and the rotating mirror (where plasma rotates around the symmetry axis subject to a radial electric field that induces an E x B drift in poloidal direction). These concepts, still in a preliminary stage of development but based on physics are to a large extent similar to the other mirror concepts, but will not be further considered here. At present, experiments with multiple mirrors are still carried on GOL-3 at Novosibirsk [Kruglyakov et al., 2002]. Several studies have involved the tandem mirror as a space propulsion system. Here we consider the study in [Kulcinski et al., 1987] for a space orbiting advanced fusion reactor (SOAR; see Figure B.13). 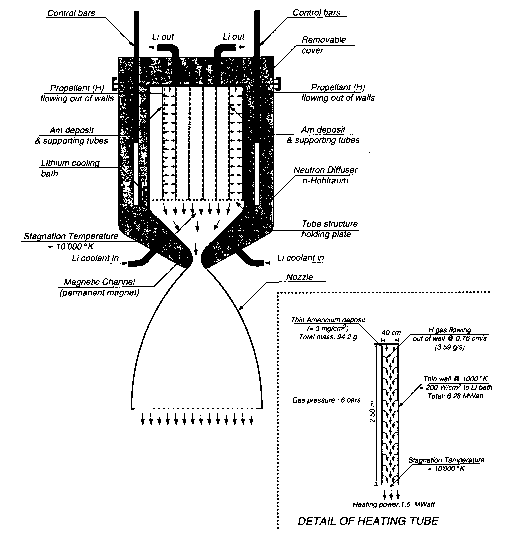 Although the system was proposed for energy production only, its features are similar to those of a propulsion system. The electric power is 1 GW and is produced by the D-3He reaction through direct conversion (80% efficiency has been assumed). The fusion power is 1.9 GW with 70 MW in the form of neutrons; about 470 MW are lost through radiation. The shield is designed to absorb all rejected heat, without using a radiator. An optimized LiH blanket is employed as a shield, with a total mass of about 300 t. The length of the central cell is 73 m with a radius of 0.55 m. The total estimated mass of the system is 5001, with an equivalent specific power of 2 kW/kg. The magnet system is axisymmetric and uses (NbTi) superconducting coils for the central cell creating a 7.7 T field, (Nb3Sn) 18 T choke coils, and 12 T end coils. The auxiliary heating power is 70 MW produced with 75% efficiency. up to 18.5 T, injection energy up to 200 keV, and fusion power to 147 GW. The increase in volume also increases the radiator mass (>300,0001!) but specific power is also increased («80kW/kg). How electricity is produced for the neutral beam power supply is not discussed. All these figures and especially those associated with the energy budget are somewhat inconsistent and should be taken with a pinch of salt.